On my long weekend, we went out on Setaka's Birthday trip. in the most west end of county in UK –Cornwall. notably Ben Nicholson and Barbara Hepworth. Still now, new groups of artists are making their marks in this area by opening up galleries, studios and potteries. I heard that it is something to do with the "light" shining in St Ives that magnets all the artists. for Cream Tea (Clotted cream on scones with jam). yum. Fore St Deli. We got to found the very neat selections of organic veggies, bread, and cheese from Cornwall. 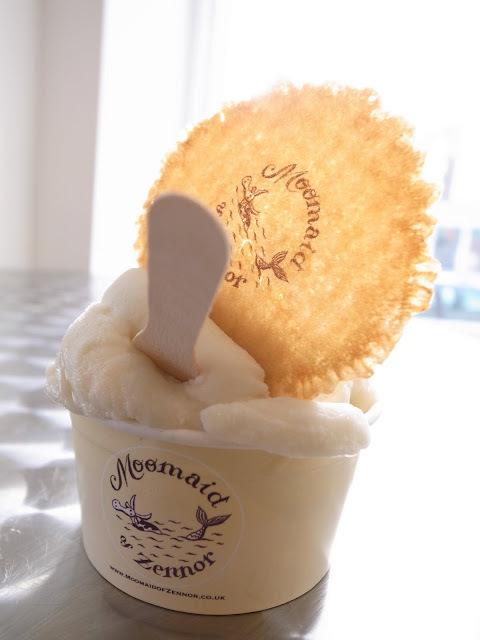 and beautiful ice cream of Moomaid of Zennor. Nobody can resist a moomaid. Even the weather. Dinner at St Andrews St Bistro. we enjoyed the last open day of their season. and yes, it was Halloween day! seems like we were eating whole day... *cough* yes we were.